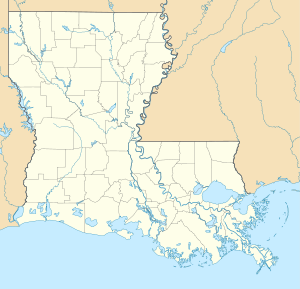 Barksdale Air Force Base (AFB) (IATA: BAD, ICAO: KBAD, FAA Location identifier: BAD) is a United States Air Force base located approximately 4.72 miles (7.60 km) east-southeast of Bossier City, Louisiana. The host unit at Barksdale is the 2d Bomb Wing (2 BW), the oldest Bomb Wing in the Air Force. It is assigned to the Air Force Global Strike Command's (AFGSC) Eighth Air Force (8 AF). The 2 BW is equipped with the B-52H Stratofortress bomber, and provides flexible, responsive, global combat capability, autonomously or in concert with other forces, and trains all Air Force Global Strike Command and Air Force Reserve Command B-52 crews. Barksdale AFB was established in 1932 as Barksdale Field and is named for World War I aviator and test pilot Lieutenant Eugene Hoy Barksdale (1896–1926). The 2d Bomb Wing conducts the primary mission of Barksdale Air Force Base, La., with three squadrons of B-52H Stratofortress bombers – the 11th Bomb Squadron, which is the training squadron, the 20th Bomb Squadron and the 96th Bomb Squadron. Together they ensure the 2d Bomb Wing provides flexible, responsive, global combat capability, autonomously or in concert with other forces, and trains all active-duty and reserve B-52 crews. The 2d Bomb Wing was assigned to the Air Force Global Strike Command on 1 February 2010. Air Force Global Strike Command provides combat ready forces to conduct strategic nuclear deterrence and global strike operations in support of combatant commanders. More than 15,000 active-duty, Air Force Reserve members and civilians make up Barksdale's workforce. About 44 B-52 Stratofortress aircraft are also assigned to the wing. The commander of the 2d Bomb Wing is Colonel Andrew Gebara. He also functions as the installation commander of Barksdale Air Force Base. The vice commander is Colonel Leland Bohannon. The base is closed to the public. However, the base is home to the Eighth Air Force Museum, which hosts static displays of numerous aircraft including a Royal Air Force Avro Vulcan bomber, B-24, B-17, P-51, SR-71, F-111, and multiple versions of the B-52. There is an annual open house when non-DoD visitors are allowed. Visitors may also tour the museum from 9:30 am to 4 pm every day except official holidays. Airships were still in use when field construction began, so Hangars One and Two were built large enough to accommodate them. No airships were ever assigned, but each hangar was large enough to accommodate two B-52 aircraft wingtip to wingtip, which proved invaluable for Big Belly and Pacer Plank modifications managed by Boeing's Wichita plant between 1965 and 1973. For more information on the modifications, see B-52 missions from U-Tapao. Half of the B-52Fs mentioned were deployed from Barksdale, but never returned as they were replaced by B-52Gs after the Vietnam War. As early as 1924, the citizens of Shreveport became interested in hosting a military flying field. In 1926, Shreveport citizens learned that the 3rd Attack Wing stationed at Fort Crockett, Texas, would be enlarged by 500 percent and would require at least 20,000 acres (81 km2) to support aerial gunnery and a bombing range. In February 1928, a delegation of prominent Shreveport citizens hired a young crop duster, an Air Corps captain named Harold Ross Harris, to fly over the local area and find a suitable site for an airfield. Captain Harris selected what he felt was an adequate location for a military airfield. It was a sprawling section of cotton plantation near Bossier City The site selection committee, representing the wealthiest taxpayers in the city, unanimously agreed upon the Barksdale Field location. A delegation of citizens traveled to Washington, D.C., to personally present the advantages of the proposed site to the War Department. Following the return of this delegation, a special Army board visited Shreveport and reported the location met all requirements of the Air Corps. The site was selected 5 December 1928, as the location of the airfield. Construction of Barksdale Field began in 1931, when hangars, runways, and billets were built. Early flying operations began on 7 November 1932, with the arrival of the 20th Pursuit Group and its three pursuit squadrons equipped with the Boeing P-12 and P-26 Peashooter. The airfield was officially opened and dedicated on 2 February 1933. Due to budget reductions in the B-45 program, the air force planned to inactivate the 47th Bomb Wing and transfer its B-45s and personnel to Yokota AB, Japan so Far East Air Forces could benefit from the know-how gained by the 47th at Barksdale. However the costs of moving the aircraft to Japan were substantial, as the range of the B-45 was insufficient to fly from California to Hawaii, and the aircraft could not be equipped with external fuel tanks. Initial use of the B-45 at Barksdale also showed that the aircraft was not truly operational, with ineffective fire control and bombing systems along with structural weaknesses developing on the aircraft already in use. In addition, each engine had to be inspected after only 7½ hours of use. If found serviceable, it could be only flown another 7½ hours before a total overhaul was necessary. It was determined that the aircraft simply could not be deployed overseas and put into operational use. It took almost two years until Air Materiel Command could work out these issues and have the 47th Bomb Wing's aircraft ready for operational use. U.S. Representative Joe D. Waggonner, Jr., worked successfully to keep Barksdale open during his time in Congress. Through his efforts, Barksdale survived base closures that occurred elsewhere across the nation . The 91st was equipped with a myriad of aircraft, including versions of the Boeing B-17 Flying Fortress (RB/TRB-17); B-29 Superfortress, (RB/TB/TRB-29); Douglas C-54 Skymaster (RC-54); B-50 Superfortress (B/RB-50), and the RB-45 Tornado. The 91st maintained operational detachments of aircraft and crews drawn from several components to provide reconnaissance support in overseas areas, including the United Kingdom and locations in North Africa. Deployments would be routine and last for periods of about three months. Initially flying the B-29, after arriving at Barksdale the 301st was one of the first units to conduct aerial refueling operations with the KB-29 tanker version of the Superfortress. The wing converted to the Boeing B-47 Stratojet in 1953 and traded in its KB-29 tankers for the upgraded Boeing KC-97 Stratotanker. To provide air defense of the base, United States Army established the Barksdale Defense Area in 1959 and constructed Nike-Hercules Surface-to-air missile sites for air defense. Sites were located near Bellevue (N.E. of Shreveport) (BD-10 32°40′28″N 093°30′34″W﻿ / ﻿32.67444°N 93.50944°W﻿ / 32.67444; -93.50944, and Stonewall (BD-50) 32°17′39″N 093°47′17″W﻿ / ﻿32.29417°N 93.78806°W﻿ / 32.29417; -93.78806 Louisiana. They were operational between November 1960 and March 1966 when they were inactivated as part of the reduction of the air defenses in the United States against aircraft. On 10 October 1951 the 376th Bombardment Wing was reassigned to Barksdale from Forbes AFB Kansas. Initially equipped with obsolescent B-29s, the wing upgraded to the B-47 in 1953 and engaged in ECM operations, which became the wing's primary mission in September 1953. The 376th began EB-47s from 1954. The wing was reassigned to Lockbourne AFB on 1 December 1957 where it replaced and absorbed the personnel and assets of the 91st Strategic Reconnaissance Wing and was redesignated the 376th Bombardment Wing (electronics countermeasures), flying EB-47E's. Following the transfer 301st and 378th Bomb Wings in 1957 and 1958 respectively, Barksdale was slated to receive Boeing's newest pair of strategic aircraft: the B-52 Stratofortress and the KC-135 Stratotanker. The mission of Barksdale was also changed from being a SAC training base to a front-line operational base. During the Vietnam War, the 2d Bomb Wing deployed to Southeast Asia for "Arc Light" and "Young Tiger", including use B-52G in Linebacker I and Linebacker II raids of 1972 – 73 at the end of the Vietnam war. In addition to a the Motorola SST-181 X Band Beacon Transponder for Combat Skyspot, the B-52G had onboard electronic countermeasures for protection against enemy Surface-to-air missiles. In the latter stages of Linebacker II, some of the B-52Gs were diverted in-flight to targets deemed to be less dangerous. All aircraft and crews returned to Barksdale in January and October 1973. In 1978, the Eighth Air Force Museum was established at Barksdale with the arrival of a B-17 Flying Fortress of the type the "Mighty Eighth" flew during World War II. The museum has grown greatly over the years, and today its collection includes the B-24, B-29, B-47, B-52D, B-52G, British Avro Vulcan B.Mk2, FB-111A, C-45, C-47, VC-64, KC-97, KC-135, P/F-51D, F-84F, MiG-21F, T-33 and SR-71A. Barksdale's 32d Air Refueling Squadron received the first operational KC-10A Extender aerial tanker in November 1981. The 32d ARS was reassigned to the 458th Operations Group on 1 June 1992 and to the 305th Operations Group on 1 July 1995. The 71st ARS was reassigned to the 458th Operations Group at McGuire AFB, New Jersey. Barksdale's last KC-135 was placed in the Eighth Air Force Museum after its final flight in March 1994 and the last KC-10 departed for McGuire AFB in October. On 20 September 2009, the airport was again used as a refuelling stop for the Space Shuttle's return flight to the Kennedy Space Center, as has done numerous times before. This time is was the Space Shuttle Discovery that was being piggybacked from Naval Air Station Joint Reserve Base Fort Worth. The Shuttle Carrier Aircraft and Space Shuttle Discovery remained at Barksdale over night. The base turned its attention from combat to more peaceful pursuits when two B-52s, a KC-10 and their crews visited Dyagilevo Air Base, Russia, in March 1992. In May 1992, Barksdale hosted a return visit by two Russian Tu-95 "Bear" bombers, an An-124 "Condor" transport and 58 Russian airmen. The Russians stayed for six days, seeing a slice of America and participating in Strategic Air Command's final Bombing and Navigation Competition awards symposium. The Russians visited again in August 1994, bringing a Tu-95 "Bear" and an Il-78 aerial tanker. Barksdale began a friendship with Ukrainian Air Force airmen later in 1994, when a B-52 and KC-10 visited Poltava Air Base, Ukraine. An equipment change began also in 1992 when the 596th Bomb Squadron retired its B-52Gs and replaced them with B-52Hs from inactivating squadrons at other former SAC bases. The 596th itself was inactivated when it was replaced by the 96th Bomb Squadron on 1 October 1993. The 20th Bomb Squadron was reassigned to the 2d Wing on 17 December 1992 when it and its B-52Hs were reassigned to Barksdale from the 7th Wing, the latter which was relocating from the closing Carswell AFB, Texas and transferring to Dyess AFB, Texas in order to transition to the B-1 Lancer. Immediately following the devastating terrorist attacks on 11 September 2001, Barksdale provided a safe haven for president George W. Bush on his return flight to the nation's capitol. Shortly thereafter, the National Command Authority called upon the base to provide substantial forces to spearhead the Global War on Terrorism. Operating from multiple overseas locations, Barksdale warriors and B-52s, both active and reserve alike, played a key role in Operation Enduring Freedom, which saw the elimination of the repressive Taliban regime of Afghanistan. The operation also resulted in the destruction of the Al-Qaeda leadership and training infrastructure that had previously resided with impunity in that country. Returning yet again to the skies of Iraq, Barksdale B-52s flew over 150 combat sorties against military targets throughout the southern half of the country during Operation Iraqi Freedom. In its 2005 BRAC Recommendations, DoD recommended to realign Eielson Air Force Base, Alaska. Some of the 354th Fighter Wing’s assigned A-10 aircraft (located at Eielson AFB) would be distributed to the 917th Wing Barksdale Air Force Base (three aircraft). This recommendation was made because, although a base with high military value, Eielson was an expensive base to maintain. In another Recommendation, DoD recommended to realign Air Force Reserve fighter assets at Naval Air Station Joint Reserve Base New Orleans, LA. It would distribute six of the 926th Fighter Wing’s A-10 aircraft to the 917th Wing. On 30 August 2007, a B-52 originating from Minot Air Force Base carried six AGM-129 ACM cruise missiles, each loaded with a W80-1 variable yield nuclear warhead, to Barksdale without the knowledge of base personnel or crew. This incident sparked controversy across the country. As an end result of the situation, Secretary of Defense Robert Gates announced that, "A substantial number of Air Force general officers and colonels have been identified as potentially subject to disciplinary measures, ranging from removal from command to letters of reprimand," and that he had accepted the resignations of USAF Secretary Michael Wynne and USAF Chief of Staff Michael Moseley. Bossier Base, now called The East Reservation due to its location east of the runway, was formerly a Defense Atomic Support Agency (DASA) Q clearance maintenance and WSA during the Cold War. It was similar to Sandia Base's Manzano. Once entirely independent of the USAF and Barksdale AFB, it has been merged with the main base. Beau Morris, "The Political Origins of BAFB," Vol. 8, No. 3 (Spring 1977), pp. 131–136. ↑ Amber Ashcroft, Serving up good conversations for 60 years, Air Force Print News, 1 September 2010. ↑ Christian Brahmstedt, ed (2002) (Book). Defense's Nuclear Agencies, 1947–1997. DTRA history series. Washington: Defense Threat Reduction Agency, U.S. Dept. of Defense. pp. vi, 458 p. :. OCLC 52147468. http://lccn.loc.gov/2003431067.